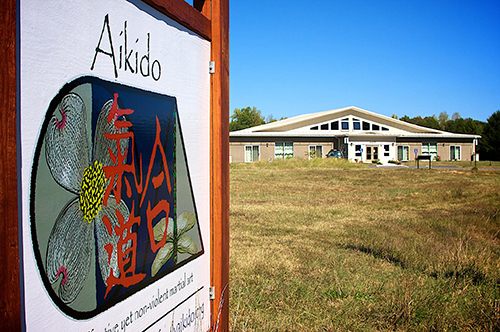 Among our visions was to create a world-class training center for Aikido and to support the local community. Toward this end, we arranged for the planning, design, and construction of a new Dojo facility. The program here is modeled after that of the Iwama Dojo in Japan. We currently have a long-term lease for the use of the Dojo and grounds. The 7200-square-foot Dojo, which opened at the end of 2009 after a decade of visioning and work, is a world-class energy-efficient facility that includes air conditioning, showers, locker rooms, an expansive mat area, uchideshi facilities, and space for seminars. Many environmental features are incorporated into the site design. The site plan has won a low-impact design innovation award from the EPA. The building design also has many conservation elements. The dojo is one of the few buildings in the U.S. designed from the ground up to be an Aikido training hall. Many visitors notice a calm yet powerful feeling upon entering. Come and visit!